The recently-released Michelin Guide has given a second star to the Japan-born chef trained by Nicolas Le Bec for his restaurant in the sixth arrondissement of Lyon. Lyon now has a third restaurant with two stars in the Michelin guide. 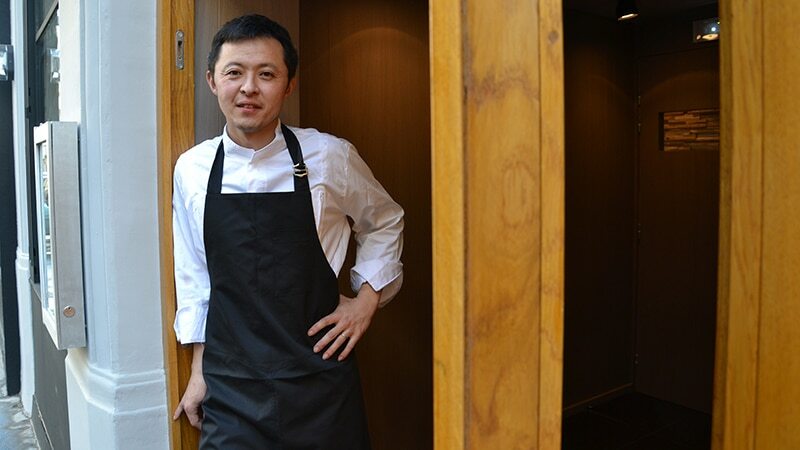 After Mathieu Viannay’s “La Mère Brazier” and Christophe Roure’s “Le Neuvième Art,” it’s Takao Takano’s turn reap the rewards of the celebrated guide in his self-named restaurant on Rue Malesherbes in the 6th arrondissement. Takano in front of his restaurant in the sixth arrondissement of Lyon. 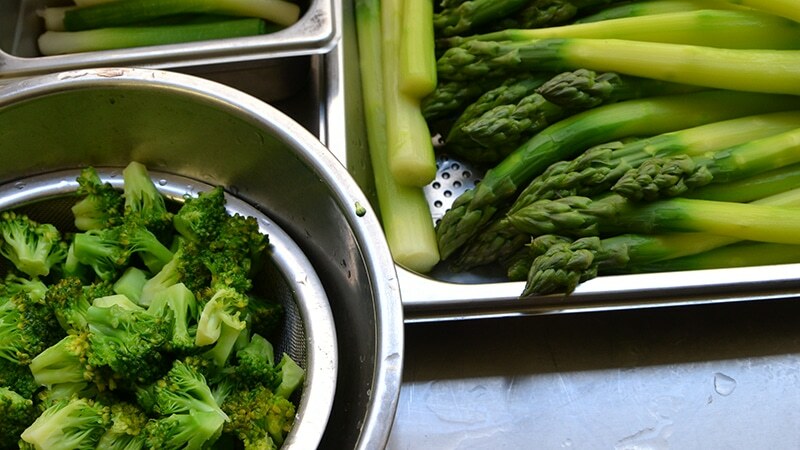 “Using the best products, he designs pure, simple dishes for his customers with immense originality and finesse. One is lulled by the harmony and subtlety of his creations: it’s simply exquisite,” said the Michelin guide in its rating list made public February 5. This reward is well-deserved for this chef who is as much understated as precise, born 42 years ago in Japan. As a young man, Takano planned to become a lawyer. After abandoning this path to pursue a career in the restaurant industry, he began work at a French restaurant in Tokyo. In 2002, inspired by French culture but unable to speak a word of French, Takano set off for Lyon. He took a gamble, and was hired by Nicolas Le Bec, an up-and-coming cook named the best chef in France by the restaurant guide Gault et Millau. Takano cooks up a dish in the kitchen of his restaurant. He was taught by celebrated Lyon chef Nicolas Le Bec. Takano worked beside the star-rated Le Bec for eight years, inheriting from him a love of fresh, pure products. In 2010, he took over the kitchen at Le Bec’s restaurant on Rue Grolée, and received his first Michelin star there a year later. However, the business changed its approach just before being sold, leaving “Taka” without a kitchen. In 2013, after a year spent traveling in France meeting with food producers and vintners, Takano opened his own restaurant near Maréchal Lyautey Square. Through a heavy wooden door and past a skylight, patrons discover a bright room full of calming décor. “I wanted to create a sort of lounge, mixing both French and Japanese ambiance,” said Takano, who had his eyes fixed on regaining his star. Restaurant Takao Takano celebrates fresh, simple dishes with flavorful combinations of spices. In the kitchen, the Japanese references are subtle. His kitchen design revolves around fine, well-developed products, flavorful combinations of perfectly seasoned tastes, and flawless cooking. The lunchtime menu runs at €35, while an evening seating costs between €65 and 100. The restaurant also offers an exceptional menu of wines and bottles at reasonable prices. Japanese chefs are popular in France. 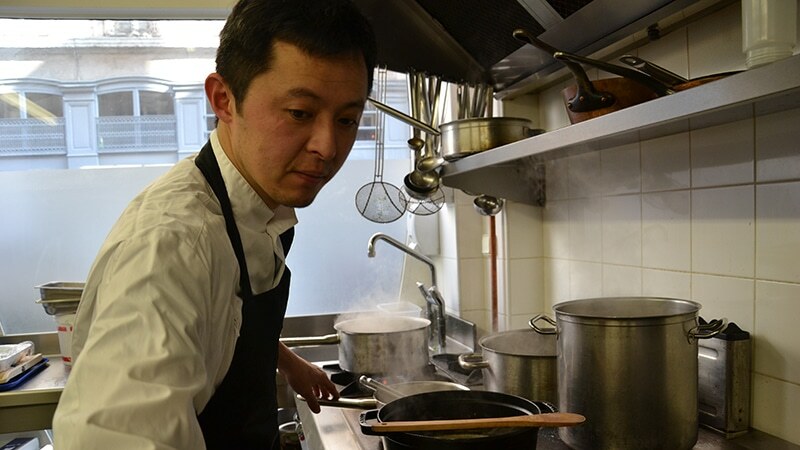 Masafumi Hamano also received a second Michelin star for his restaurant “Au 14 Février” located in the Beaujolais, at Saint-Amour (Saône-et-Loire). Like Takano, Hamano began his career under the tutelage of Nicolas Le Bec.